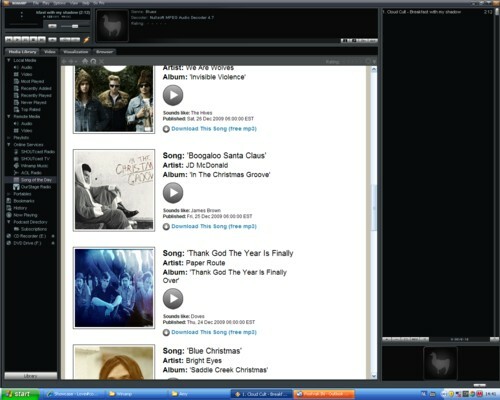 I use Winamp as my mediaplayer. Not that I have a real preference, I liked my Windows mediaplayer too, but one day I suddenly had a Winamp mediaplayer. I guess I must have accidentally downloaded it when I tried it on the site of Radio 100. I remember that they adviced listeners to get a Winamp player. This Winamp player happened to play Flac audio files. John Koenmans sends me these files sometimes and it bothered me that I could listen to them. But now I can! A few days ago I hit a wrong button on my Winamp player and discovered that their ”song of the day” feature. Everyday you can download a song for free. In the information on the pages that features the Winamp songs-of-the-day, the artists are compared to an act that is better known. They say that J.D. McDonald sounds like James Brown. Might be, I should hear his whole CD, but this song reminds me more of the ledgendary T. Valentine. To my surprise T. Vantine’s hitsong, “Lucille, are you a lesbian?” , is on YouTube! This song was on one of the Big itch sampler LP’s. Later Norton Records tracked the man down and released a complete LP with his songs. The LP is certainly in the must-have-category, but there is not another Lucille on the album.